The glory of autumn leaf color in autumn is something I took forward to every year. I always try to incorporate trees into my landscape that will reward me with the most vibrant color. Not all of your trees have to turn brilliant colors, but a few strategically placed will add beauty to your property and give you pleasure every year. 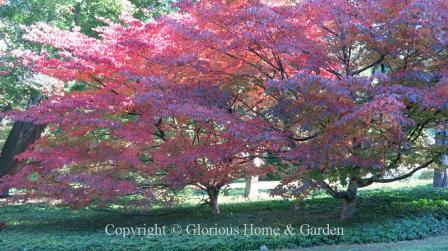 And it is easy to do because many of the best trees for autumn color are top performers in all seasons. Many factors contribute to the brilliance of fall color such as location, temperatures, soils and moisture, and the display can change from year to year. Some species color more vividly in some parts of the country than others. We all know about the spectacular colors of a New England autumn! Here are some of the best trees for autumn leaf color. Acer griseum, paperbark maple, Zones 5-7. 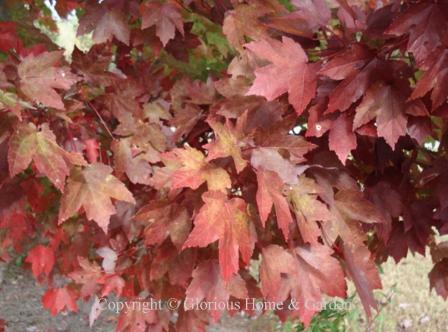 Paperbark maple is an outstanding tree for autumn leaf color. The leaves turn a brilliant crimson, and as a bonus, the exfoliating cinnamon bark is very handsome, too. An excellent choice for the home landscape. Acer japonicum, fullmoon maple, Zones 5-7. 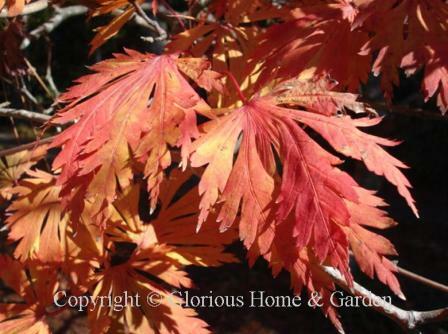 Beautiful coloration of yellow, red and orange occur on this species of Japanese maple. 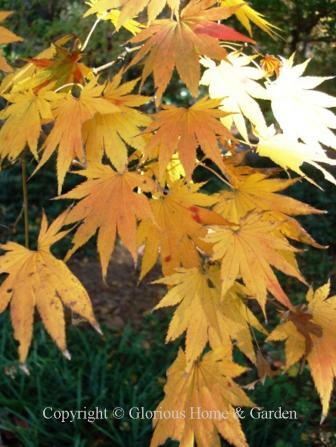 The leaves of most cultivars are not as deeply incised as Acer palmatum giving them a rounded, or "full moon" effect. 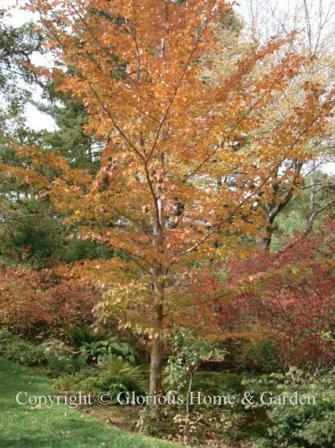 Acer japonicum 'Aconitifolium,' fernleaf maple, Zones 5-7. Fernleaf Japanese maple is one of the exceptions to the rule for Acer japonicum in that its leaves are deeply divided and incised and, well, "ferny." Turns a brilliant crimson in the fall. Acer palmatum, Japanese maple, Zones 5-8. 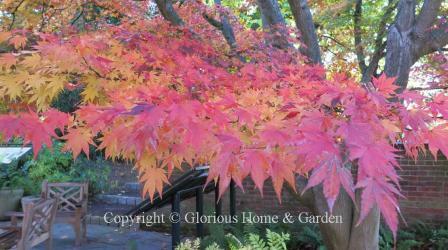 Japanese maples are the loveliest and most graceful of garden trees. They vary greatly in size, form and leaf-shape. 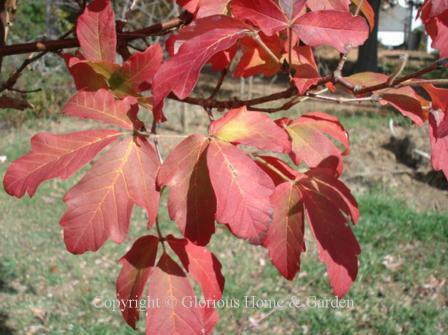 Fall color depends on the cultivar. There are two main categories: non-dissected and dissected leaf types. The non-dissected group is represented by the red 'Bloodgood' below with finger-like lobed leaves. The dissected types are represented below by Acer palmatum var. 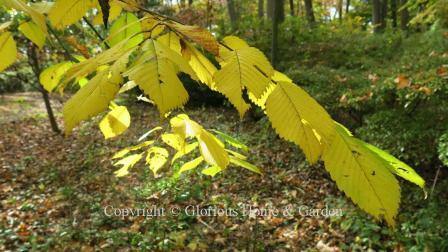 dissectum 'Viridis' with finely cut leaves that turn a lovely yellow in fall. Visit local nurseries and public gardens to see cultivars to help your selection, but do try to incorporate at least one Japanese maple in your landscape in a place of honor. 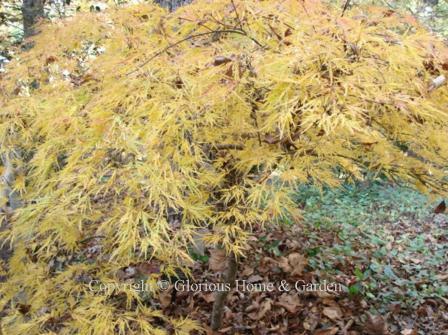 Acer palmatum 'Dissectum,' threadleaf Japanese maple, Zones 5-8. I recently saw this gorgeous specimen at the Morris Arboretum and had to include it here. 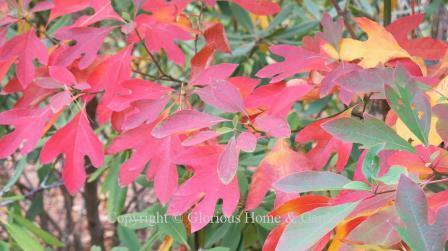 The coloration of the finely cut foliage was remarkable--a rainbow of green, yellow, orange, red and purple all exhibited together in a spectacular display! 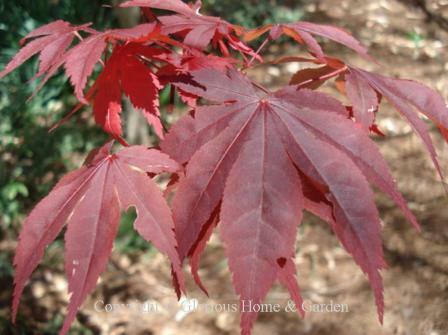 Threadleaf Japanese maple grows in a rounded mound of about 6-10' tall with equal spread. Acer pseudosieboldianum, purplebloom or Korean maple, Zones 4-7. 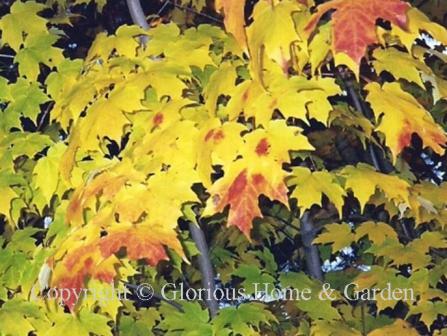 I have put this maple on my must-add-to-my-garden list after seeing some magnificent specimens recently at the Morris Arboretum! They were at the peak of autumn color in shades of orange to red to purple. Gorgeous! Acer rubrum, red maple, Zones 4-9. Our native red maples are quite variable as to autumn leaf color but certainly many are spectacular in the wild. To ensure brilliant orange to red color, choose a named cultivar such as 'Brandywine,' 'October Glory' or 'Red Sunset.' 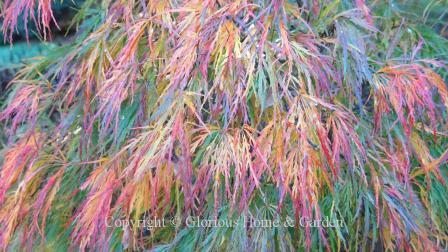 'October Glory' is pictured. Acer saccharum, sugar maple, Zones 4-8. The sugar maple is one of our most magnificent native trees. The best color show occurs in New England where trees turn yellow to orange and red and are synonymous with autumn. Is there a more breathtaking sight than a sugar maple in full autumn splendor? 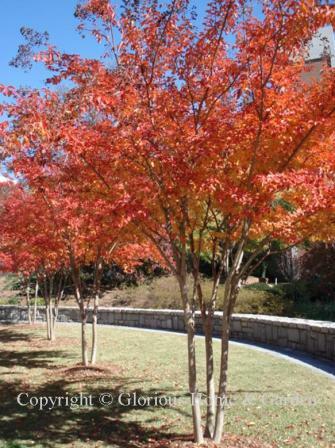 They can color quite well in the South also, and new cultivars selected for greater heat tolerance as well as autumn leaf color will make them more widely used there. Carya glabra, pignut hickory, Zones 4-9. 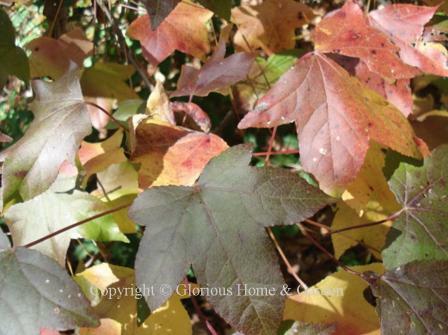 A standout in autumn woodlands with deep golden-yellow leaf coloration. Carya ovata, shagbark hickory, Zones 4-8. This young shagbark hickory exhibits the golden yellow to bronzy autumn leaf color common to the hickories that make them such standouts in the autumn woodlands. This will eventually be a huge tree of 60-80' or more so is best suited to a large property or woodland. Cercidiphyllum japonicum, katsuratree, Zones 4-8. This is simply one of the most graceful and lovely trees one can grow. 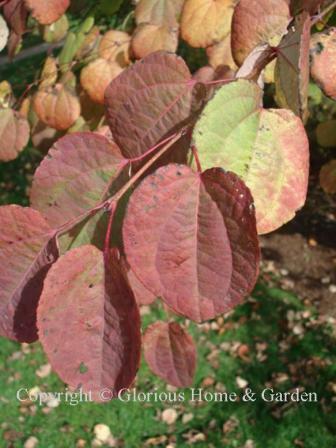 Autumn color varies from soft red to apricot-orange to yellow on rounded heart-shaped leaves similar to redbud leaves. Cornus florida, flowering dogwood, Zones 5-9. 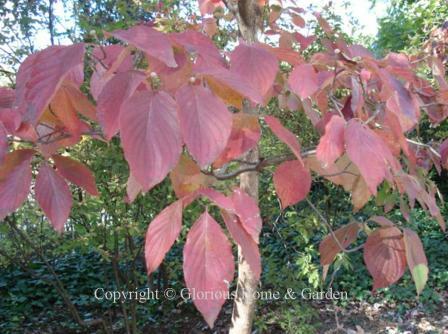 Our native flowering dogwood produces its autumn leaf color in shades of pinkish-red to deep purple-red early in the fall and lasts a long time--usually up to Thanksgiving in the South. Red berries occur along with the fall foliage but are often stripped by birds. Cornus kousa, Kousa dogwood, Zones 5-8. This Asian species turns scarlet red to purplish-red in fall, and the color persists for a long time. Franklinia alatamaha, franklinia, Zones 5-8. Franklinia is a lovely small native tree that has the distinction of flowering in the late summer to early fall. Autumn leaf color ranges from orange to red and purple. An excellent small specimen tree. Ginkgo biloba, ginkgo, Zones 4-8. 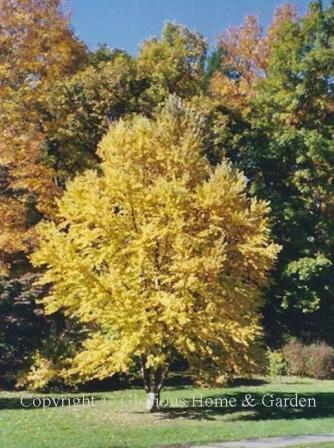 One of the most glorious trees in the fall when they turn brilliant clear yellow and then carpet the ground in gold. Can be truly spectacular. This one at the Arnold Arboretum in Boston. Lagerstroemia indica, crape myrtle, Zones 7-9. Crape myrtles, used extensively in the South, can be a shrub or small tree depending on the cultivar and whether or not they are severely pruned in late winter as is the common practice, or allowed to grow to their full height. The leaves usually turn brilliant shades of yellow, orange, red and even purple in the fall; the dried seed capsules persist through winter. Prune these off in late winter before new growth begins. Liquidambar styraciflua, American sweetgum, Zones 5-9. A distinctive native tree of the Eastern U.S. woodlands, the star-shaped leaves of sweetgums will often exhibit a kaleidoscope of green, yellow, orange, red and purple autumn color at the same time. Liriodendron tulipifera, tulip poplar, Zones 4-9. 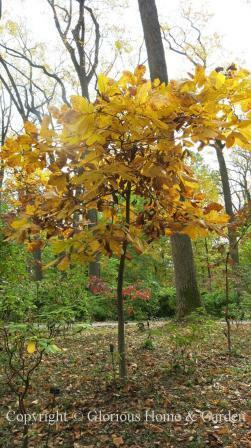 One of our most magnificent native trees with tulip-shaped leaves that turn a clear yellow in the fall. They will sometimes begin turning color in late summer or early fall if they have been drought-stressed. Nyssa sylvatica, black tupelo, Zones 4-9. 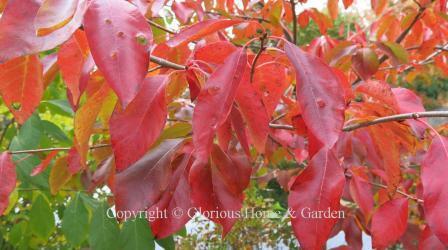 Also known as the black gum or pepperidge, this is one of our best native trees for autumn leaf color. 'Big Momma' is a cultivar with larger leaves and fruit than the species. Oxydendrum arboreum, sourwood, Zones 5-9. 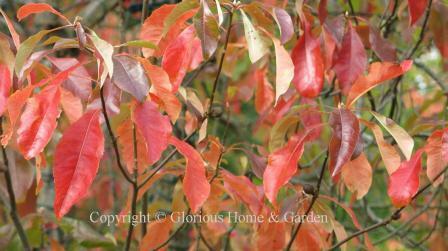 Sourwood is one of the first trees to begin turning color in the fall, and one of the longest lasting. 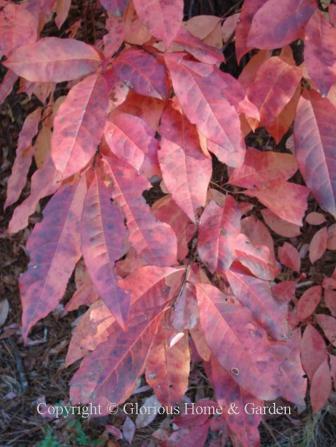 Leaves can become pinkish to crimson red to purple. Pistacia chinensis, Chinese pistache, Zones 6-9. 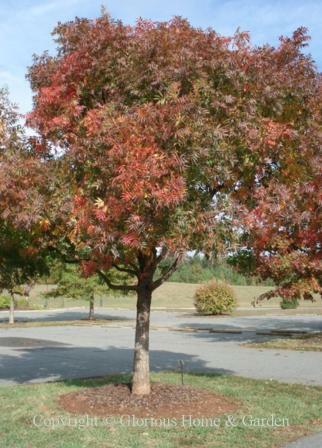 This is an excellent tree for brilliant fall color especially in areas prone to drought such as the south and midwest. Good use was made of them in the parking lot of the Daniel Stowe Botanical Garden in Belmont, N.C.
Prunus x yedoensis, Yoshino cherry, Zones 5-8. Yoshino cherries turn lovely shades of yellow and golden-orange in fall, but the leaves tend to drop early. 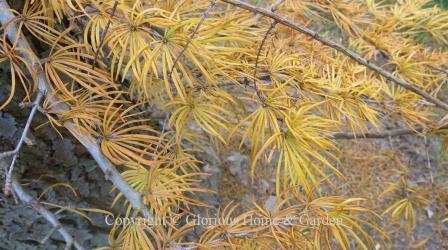 Pseudolarix amabilis, golden larch, Zones 5-7. Golden larch is one of that small group of deciduous conifers that includes the dawn redwood (Metasequoia glyptostroboides)and bald cypress (Taxodium distichum). 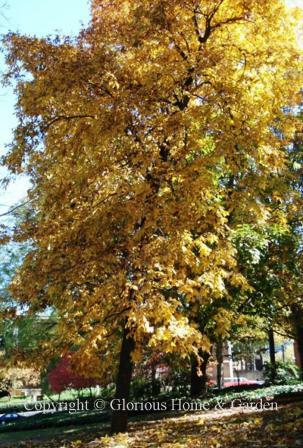 This is a large tree eventually (30-50'), but slow-growing, and turns a beautiful autumn color of golden yellow. Pyrus calleryana 'Bradford,' Zones 5-8. Bradford pears may have been overused, and they are subject to splitting and breakage if not properly pruned when young, but they are among the last trees to turn color in the fall (in the South) in deep shades of orange to wine red. Sassafras albidum, sassafras, Zones 4-9. Easily identified by the mitten-shaped leaves, sassafras is not often planted in the landscape, but should be utilized more for its brilliant autumn leaf color. Stewartia koreana, Korean stewartia, Zones 5-7. Stewartias are lovely garden specimens that often exhibit rich autumn color like this one in the Asticou Azalea Garden in Maine. Taxodium distichum, baldcypress, Zones 4-11. Baldcypress is usually thought of as a tree that grows in swampy areas, which it does, but it is also adaptable to drier conditions. 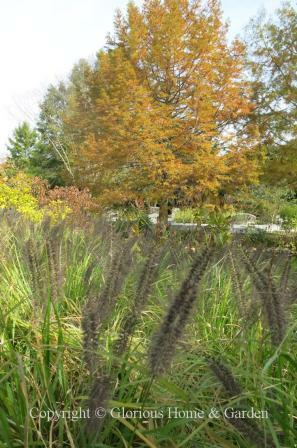 As a deciduous conifer, it can be a fine contributor to the autumn landscape turning soft orangey-brown tones as this example at the Lewis Ginter Botanical Garden in Richmond demonstrates.